Published: Nov. 17, 2013 at 11:46 p.m. Updated: Nov. 18, 2013 at 12:02 a.m. Need to improve your fantasy football roster? NFL.com Fantasy has you covered. Each week, we'll offer up 10 players you need to target off the waiver wire in your ultimate quest to take home a fantasy league championship! First it was Doug Martin lost for the season. Then Mike James. 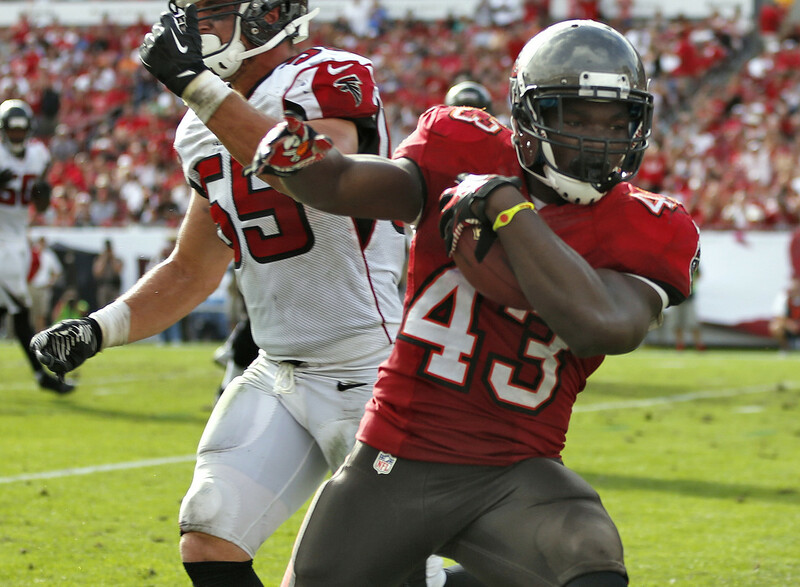 Now the top spot on the Buccaneers' depth chart belongs to Rainey, who went nuts against the Atlanta Falcons. He finished with 163 yards on the ground and three total touchdowns, which was good for 34.7 fantasy points. Rainey clearly needs to be owned in all fantasy leagues. Jennings, on this list for the third straight week, has been tremendous for fantasy owners in the absence of Darren McFadden. Since Week 9, he's scored a combined 55.1 fantasy points in standard scoring leagues. As long as McFadden is on the sideline, Jennings needs to be owned (and started) in fantasy land. He'll face the Titans in Week 12. The Colts might have acquired Trent Richardson earlier this season, but Brown has been the better running back recently, with a combined 33.7 fantasy points the last two weeks, or more than Richardson has recorded in his last six games. If you're starting a Colts runner, it should be Brown ... not Richardson. Fleener has been a far more consistent fantasy option in recent weeks, scoring eight-plus points in three of his last four games. He had his best stat line since Week 4 against the Tennessee Titans, recording eight catches for 107 yards. With Reggie Wayne out of the mix, look for Andrew Luck to target Fleener more often over the next several weeks. Boykin has become a popular target for quarterback Scott Tolzien, catching a combined 14 passes for 203 yards over the last two weeks. That sort of production makes him a nice option, especially for PPR formats. The Packers have a great matchup against the Minnesota Vikings next, so Boykin has some definite starting appeal at this point. When Eli Manning throws touchdown passes, he throws them to Randle -- each of his last six scoring strikes have gone to his second-year wideout from Louisiana State. Next on the schedule is a date with the Dallas Cowboys, who Randle torched for five catches and 101 yards in the season opener. Consider him a viable No. 3 wideout when the matchup is favorable. Over the last three weeks, Cotchery has hauled in at least one touchdown pass per game and has found the end zone five times overall. With Emmanuel Sanders injured in Week 11, the veteran wideout could see even more opportunities in the pass attack. Cotchery, who faces the Cleveland Browns next, is now someone to target at wide receiver. Walker has been hot, scoring two touchdowns and a combined 27.3 fantasy points in his last two games with Ryan Fitzpatrick, not Jake Locker, at the helm of the offense. The Amish Rifle now is the No. 1 quarterback in Tennessee, so it makes sense to pick up one of his favorite targets at a position that has been tough to predict in 2013. Owners in deeper leagues should consider Ogbonnaya, as he now looks like the top runner in Cleveland. Not only did he post a solid 8.6 yards-per-carry average, Ogbonnaya had six receptions and 14 touches. Since good running backs are hard to find on the waiver wire at this point in the season, he's worth a look if you have the roster space. If you have room on your roster to stash a player, take a chance on Crabtree. He's returned to practice for the 49ers and could be back on the field in the next 1-2 weeks. While there's some question about how effective he'll be coming back from a major procedure on his Achilles tendon, Crabtree is worth a roll of the dice.